This entry was posted on February 12, 2019 by Rob Storrar. Blade Runner, the film, was released to the public in 1982 and is set very conveniently in the year 2019 (believe it or not I have been waiting to use the name of the film since I started my TTT blogs many years ago) Director Ridley Scott was born in South Shields, just across the river Tyne from my favourite pub the Low Lights, and like me managed only one O level. I wondered if he found that skiving off school to go messing about in boats was more attractive than schoolwork? In the film Blade Runner, ex detective Rick Deckard is called out of retirement to track down and eliminate a team of humanoid androids that have escaped. Up on planet Newcastle today, February the 12th 2019, the boss of www.marinechandlery.com Andy Burgess has been asked to track down the missing blade which has done a runner, boom boom! Does he fail to complete his mission or does he pass with flying colours and track a replacement down? Only time will tell. 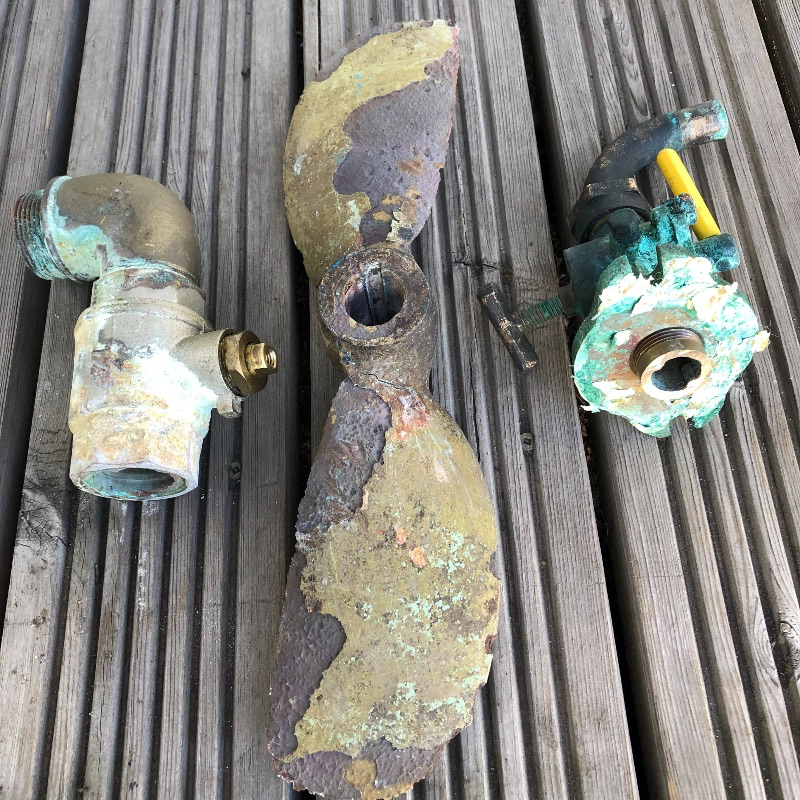 If you take a wander round your local boatyard and stick your head down low you will be surprised with the number of both powerboats and yachts that have been lifted out with little or no anode(s) left on the backing plate! If the anode is not doing its job for whatever reason, earth wire broken, been painted over, fallen off or just wasted away, failing to keep an eye on the anode(s) can lead to some very expensive repair bills. 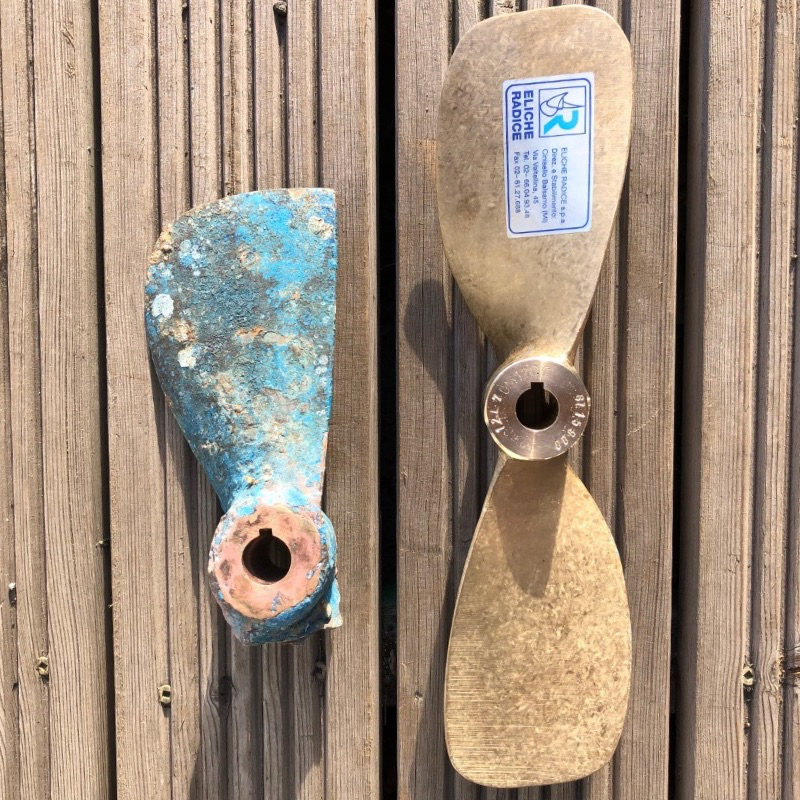 Whilst a replacement two bladed prop can be had from around three hundred pounds a rebuilt stern drive for a powerboat or sail drive, what with parts labour, lift out/in can run into thousands. A sinking through the failure of a skin fitting, apart from the danger of loss of life may be hundreds of thousands. I have seen an aluminium yacht salvaged from the seabed and the hull reminded me of a colander, what happened to the cathodic protection? 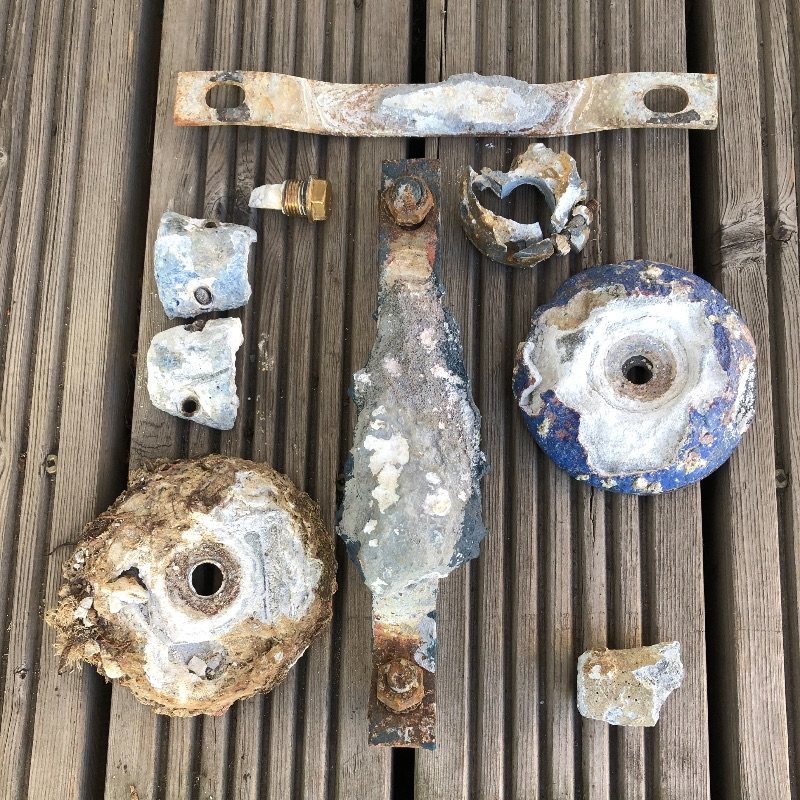 Sacrificial anodes are supposed to do what they say on the box ie sacrifice themselves whilst protecting the superior metal, however for me to even try to attempt to explain this ‘black art’ would be like me trying to explain the theory of relativity to Jenny! However our very good friends at M.G.Duff advise us that Cathodic protection is an electrochemical process which halts the natural reaction (corrosion) of metals in a particular environment by superimposing an electrochemical cell more powerful than the corrosion cell. 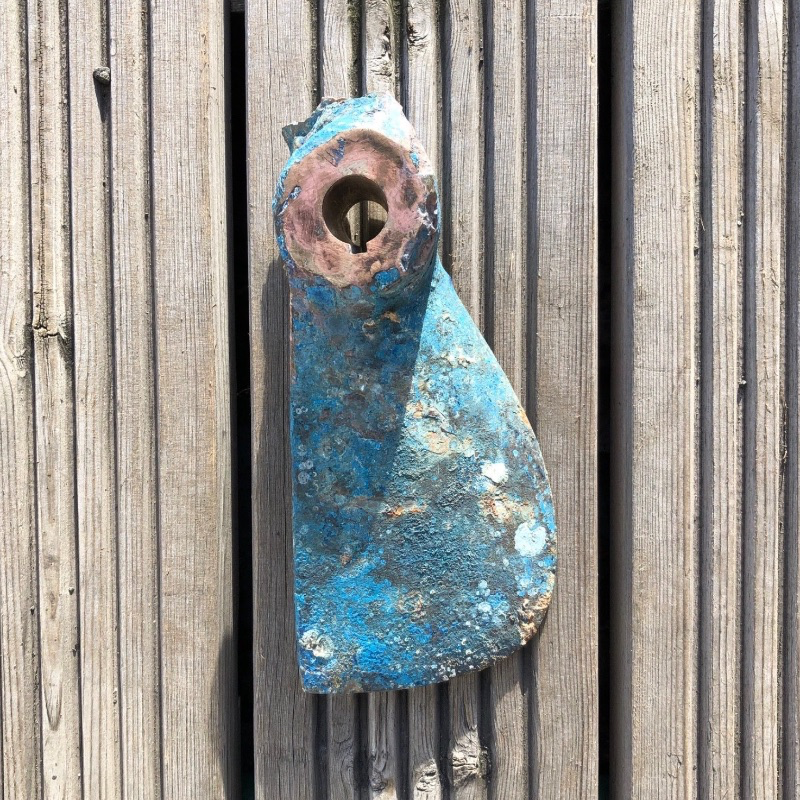 Sacrificial Anodes are fitted or bonded to the metal to be protected, this results in an electrical potential difference and the metal becomes cathodic causing the sacrificial anode to waste instead. In a correctly installed MGDUFF Cathodic Protection System corrosion only occurs to the sacrificial anode which is replaceable. The number and size of anodes is determined by the type of material and the surface area being protected. Several factors determine the type of cathodic protection system fitted. Firstly the environment in which the vessel is operating, secondly the size and type of construction and finally the length of time that the vessel is likely to be afloat before the next maintenance slipping. Check all internal bonding to ensure that the connections are clean and the cable is clipped up where necessary. if you have an MGDuff electro eliminatorcheck that the springs are sound and it is positioned so that the brushes are in contact with the shaft. Check that you are fitting the correct anode material for the waters you are in i.e. Andy, being a bit like our hero the detective Rick Deckard (note the 'nautical' name) did manage to track down a replacement so the story does have a happy ending! 246. Top Tips Tuesday - Brace Yourself! Storrar on Garmin Bluecharts - watch out! David haydon on Garmin Bluecharts - watch out!